Brian Thacker Travel Writer | AIRBNB VS Resort. On my recent family trip to Bali we split the trip in half both in the destination and the type of accommodation we stayed in. On Nusa Lemobongan we stayed in a villa in a resort, which was booked through bookings.com, while in Ubud we stayed in a private villa, which was booked through Airbnb. So, which one was better? I’ll let you decide. Below are comparisons from the initial booking to the arrival and the accommodation itself. 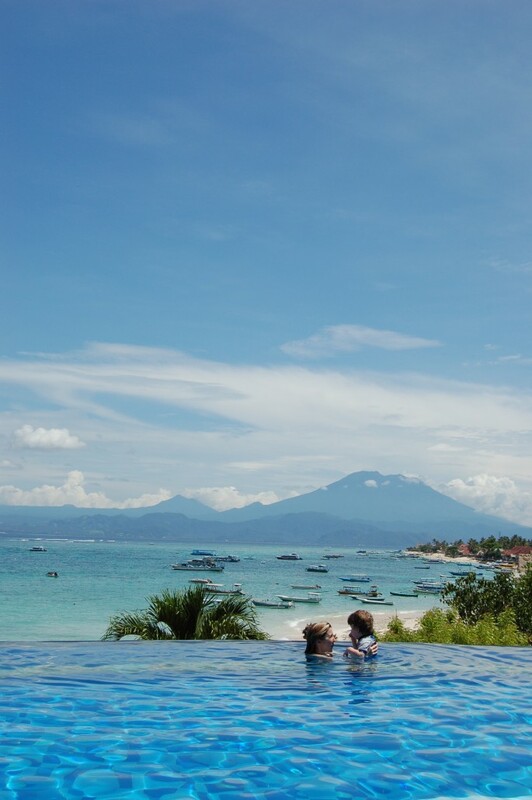 I booked our resort in Nusa Lembongan only two hours before we arrived. I had booked another resort two months before, but our original resort burnt down the day before we arrived (and thankfully not while we were there!). Lucky it was off season, because we had plenty of options to choose from. I simply went to my Trip Advisor App on my phone and found a 2-bedroom villa in a resort, then went to the Trivago App and found the cheapest deal and then to Bookings.com to make the actual booking. All up it took me about nine minutes. 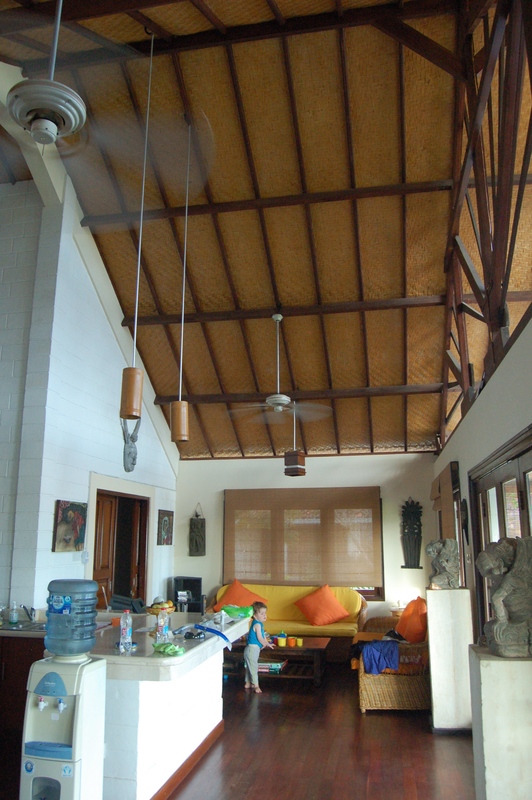 I actually had planned to use Airbnb for the whole trip, but left it too late to get a good villa in Nusa Lembongan (as in I wanted two bedrooms, a pool and in a good location) – so I booked a two-bedroom villa in a resort instead. 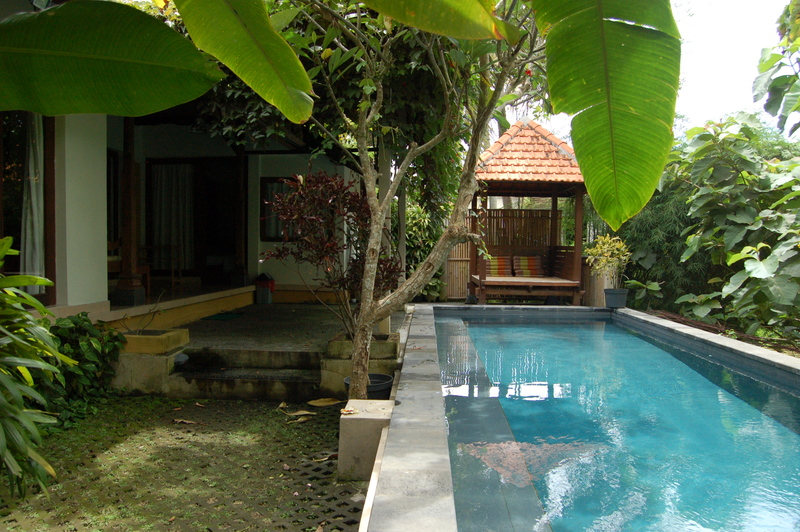 I’d booked our villa through Airbnb in Ubud eight months before we departed Australia (when I’d booked our cheap air fare) and if I had tried to book it two months before we left, the villa would have more than likely been booked already. A staff member from the resort was waiting for us on the beach (we arrived by boat) and he carried our bags up five flights of stairs to reception. We got the usual fruity-flowery welcome drink and cold face-towel, but our room wasn’t ready (we arrived at 11.00 and had to wait until 2.00). We could use the pool, though, so we went for a swim and had lunch by the pool. Once we were shown to our room a staff member went through the usual ‘Here is the light switch’ etc. Our host’s son met us at the top of the steps down to the villa and carried our bags down. Although it was 11.30 and ‘check-in’ wasn’t until 2.00 we could move straight in. 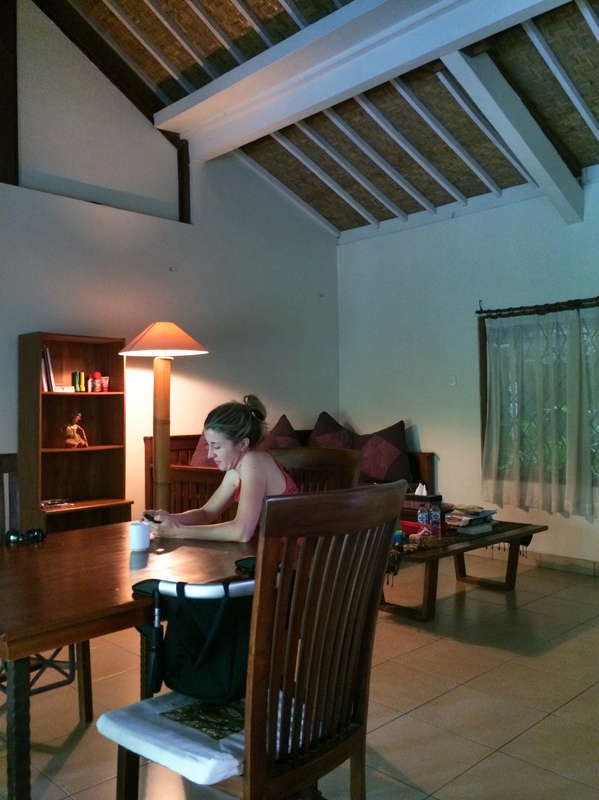 We were shown all the light switches and handed a PDF print out of the latest Lonely Planet guide to Ubud. Our villa (which was up a thigh-burning 150 steps or so from reception) had two bedrooms (both with ensuites), a large lounge area, kitchen and large balcony. 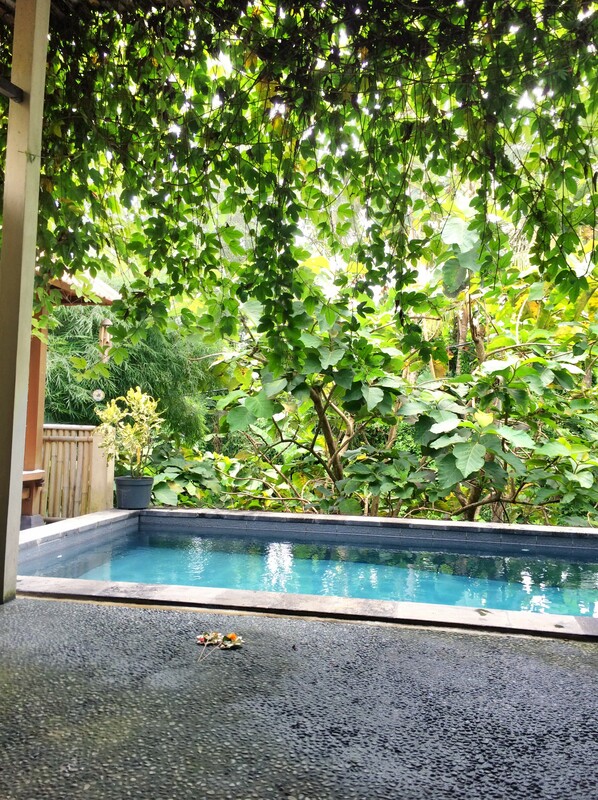 At the end of the balcony was a small pool-table-sized plunge pool. It was a short, but gut-busting (particularly lugging a 13 kilo little boy) walk down the stairs to the beach and restaurants (and breakfast each morning!). 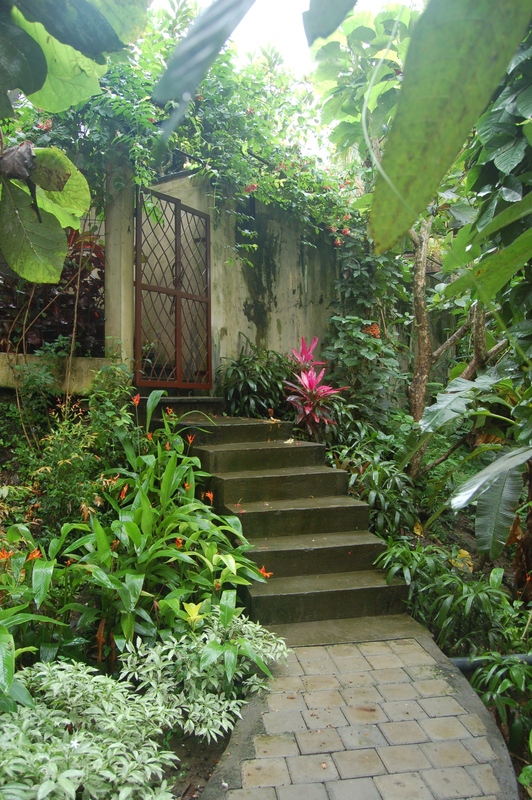 Our villa, which was surrounded by jungle, was set in a private walled garden. The villa had two bedrooms with only one bathroom, a small lounge area, kitchen and a large paved garden with a full-sized swimming pool. 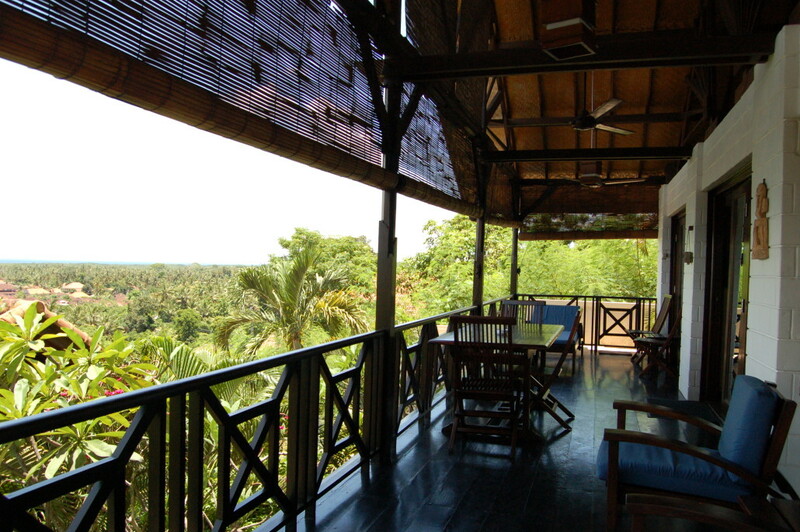 The villa was a ten-minute walk to Monkey Forest Road (the main dining and shopping street). It’s a resort, so it had all the resorty-type facilities, including an included breakfast, a swimming pool, in-room free Wi-Fi, daily sheet and towel change service and lots of friendly staff. The front desk staff were great and very helpful. I booked a snorkelling trip, scooter hire and a restaurant on the other side of the island (the restaurant picked us up and dropped us off). We requested a cot for our munchkin and it was free and in the room when we arrived. The big thing was the big pool. On Airbnb you can use filters to fine tune your search, including price, location, how many rooms and, in our case, it had to have a private pool. Our villa was cleaned daily by our host, but the sheets and towels weren’t changed. Our pool was cleaned every second day as well. We also had Wi-Fi. We requested a cot and our host organised one to be delivered from Denpasar – which was in the room when we arrived. The hiring fee was $10 a day. Breakfast was included (a choice of continental breakfast, omelette or banana pancakes). We had breakfast by the pool and, besides one morning, we were the only guest there. 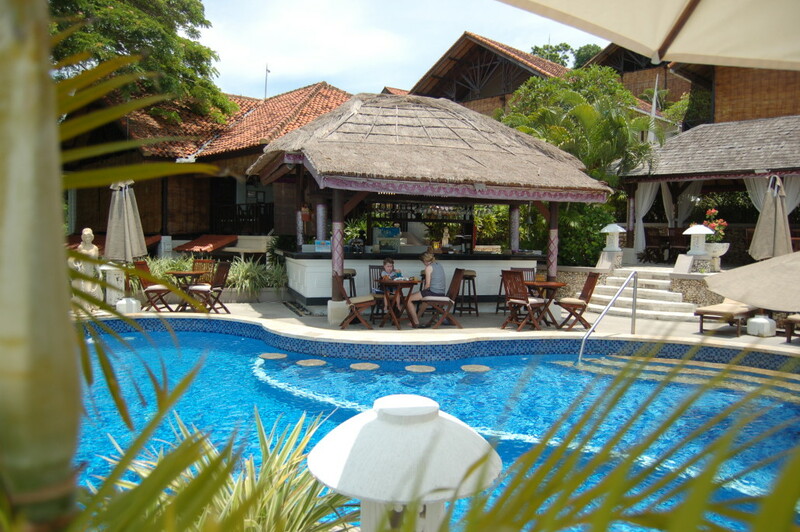 The resort also had a simple lunch and dinner menu, but other restaurants were so close we only ate one lunch there. We had a full kitchen, but we didn’t really use it at all (but only because eating out was so cheap). We’d bought breakfast cereal and peanut butter with us from Australia, so only needed to get milk and bread from a local convenience store. We also ate out for breakfast once – because it was so cheap. There were lots of restaurants within walking distance from the villa. There was actually a lot of amazing (and cheaper!) villas outside of Ubud, but they were a taxi trip away from restaurants, etc. I hate masses of crowds around a pool and breakfast buffet, so I much prefer a smaller resort. Yes, there was no Kid’s Club or room service, but I’m happy to skip that for a little bit of peace and quiet. We were also lucky that it was off-season, so we pretty much had the pool to ourselves most days. The only downside was that on our last night a big bunch of Japanese moved in next door and had a loud (as in girls squealing!) party until the wee hours. Our own private breakfast pool party. Our villa was a private little oasis. We couldn’t see or hear anybody and, being surrounded by jungle, we really felt as if we were in the wilderness – even though we were pretty much right in town. Our private pool in the jungle. You can save a whole heap of money. Not only that, you can often get a lot more room for your money, making it particularly cost effective for families. Our Airbnb villa was half the price of the resort. You do really need to book early. The earlier the better. You may find the perfect place, but it may be booked when you want stay. This is particularly likely if you’re going to a popular destination and the property has lots of great reviews. To get a place you like you need to book far, far ahead. Staff – when you need them. It’s nice to have a receptionist to book tours and restaurants. I also do like getting clean sheets and towels. And admittedly, I am on holidays, so I like having breakfast included instead of eating soggy Wheetbix. Screaming kids and screaming drunks. There’s not much privacy. It was okay where we stayed (besides the drunk Japanese), but I’ve stayed in many a resort surrounded by the hordes day and night. A wild wildlife encounter. Bloody Starbucks.